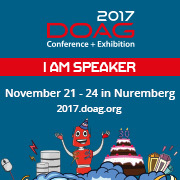 If you speak german and you are interested in some of this, you should come and attend DOAG 2017. This entry was posted on July 18, 2017, 15:07 and is filed under Deploying, Development, Quality Assurances. You can follow any responses to this entry through RSS 2.0. You can leave a response, or trackback from your own site. Oracle TranslationHub neither supported for 12c Database, 12c Forms/Reports or 64 bit! I'm a software developer since 1996. Most time I works with Oracle tools.